Emilio Pucci's Bubble Helmet was in the days prior to the air-bridge to protect the coiffure from wind and rain on the walk from the terminal to the aircraft. A Braniff International stewardess models the plexiglass headgear at John F, Kennedy Airport, New York in 1965." In the mid-1960s, Braniff Airways introduced imaginative new flight attendant uniforms created by famed fashion designer Emilio Pucci. 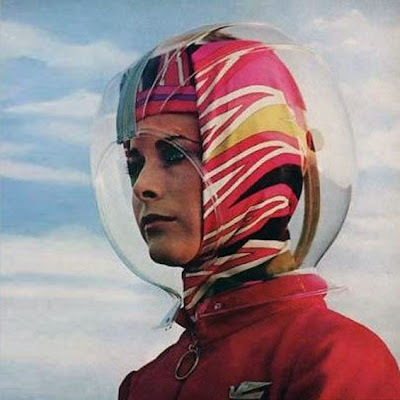 The plastic bubble helmet, to protect hairdos on windy tarmacs, was an integral part of the Pucci-designed uniforms.